Do you own, manage or represent a meeting facility in Oregon or Clark Co. Washington? 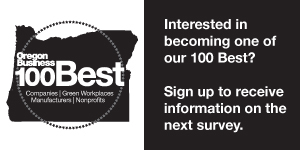 If so, use this survey to submit or update your firm's information for our annual Powerlist, published in Oregon Business magazine. To submit a new facility or update your facility's information, click here.